I managed to find some time to change the Glockenspiel controller from using ULN2803 darlington drivers to a whole bunch of discrete darlington pair transistors (BCX38C). It seemed an ideal way of coping with the huge switch-on surges and spreading the current over a whole load of different devices. The board is single sided which makes it easy enough to etch and solder up. The power is taken directly into the bottom of the board and the open collectors on the transistors do the switching. The diodes are 1N4001’s which should help to kill the transient produced when the motor is switched off. It was quite nervewracking to see the spark produced when testing the motors across a power supply, so I guess these motors are really capable of packing a punch. At the bottom, I’ve allowed a space for a polyswitch resettable fuse, although in my version it’s not actually being used. If I knew a little more, I suppose I should use MOSFETs for the switching, but I don’t and I didn’t. Sorry about that. 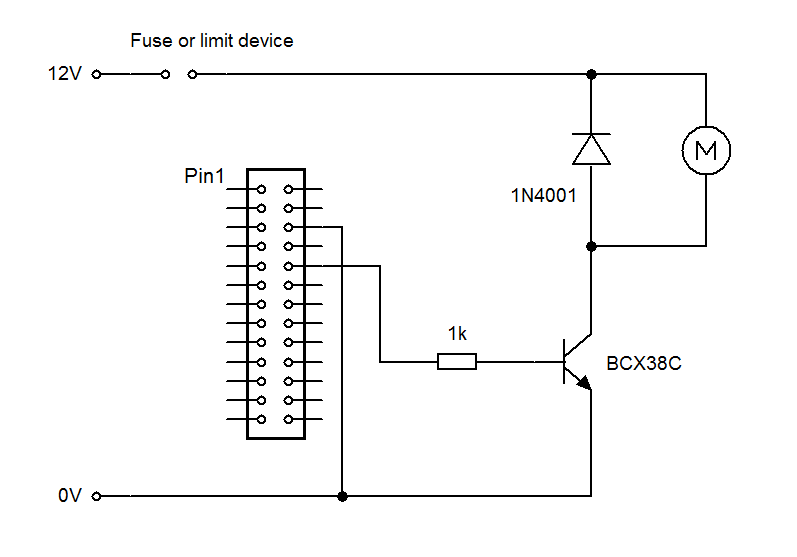 An example of the basic circuit used. 1 channel shown. One thing that occurred to me was this little board could be applied to lots of different 12v switching situations. Perhaps a large lighting display using Superflux LEDs wired in bunches.